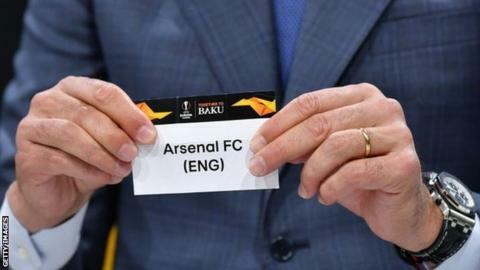 Some Arsenal fans are unhappy the side's Europa League home tie against Rennes was switched about one hour after the draw to avoid a clash with Chelsea's match against Dynamo Kiev. Arsenal and Chelsea were originally both set to play home games on 7 March. Arsenal said their tie was switched because of "Uefa's city-clash rule", with the Gunners now at home in the second leg on 14 March. Many fans say they are now facing charges to change flights and bookings. Arsenal beat Bate Borisov on Thursday to reach the last 16, but supporters criticised the decision to make that match a 17:55 GMT kick-off. After the decision to switch the Rennes tie was announced, the Arsenal Supporters' Trust tweeted: "Good news that Uefa have listened and Arsenal will play next Europa League v Rennes game in evening slot. Away leg will now come first. #PutFansFirst. "However, the communication from Uefa was questionable with many fans having potentially booked flights/trains. "The general story of the game being a normal KO is extremely positive, however, but hope fans do not lose money."